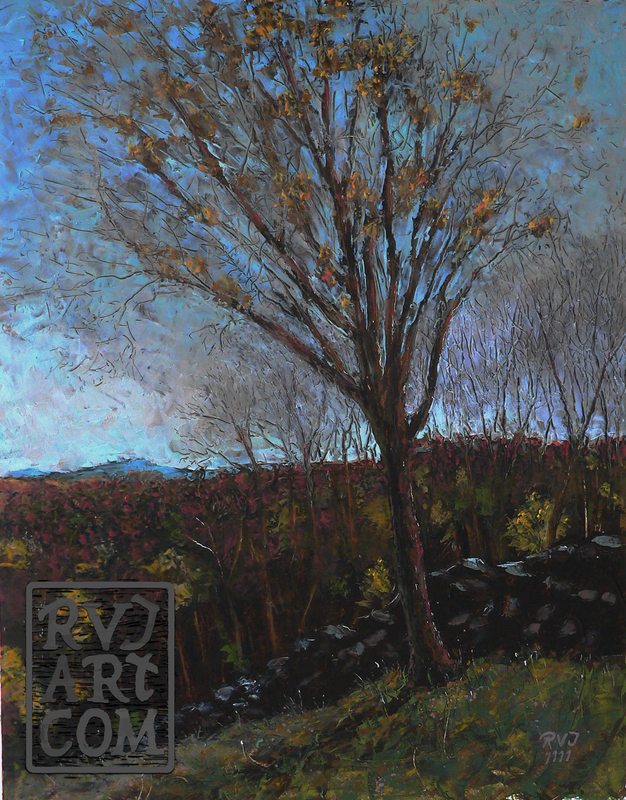 This is an original oil painting “psalm 166, Ascutney View” . In hiking late in the autumn, with the last of the leaves on the trees, I found this hilltop meadow and wall. This view is towards Mount Ascutney in Vermont. The Native Americans considered this mountain to have magic and spirits on it. The walls were built 200 years ago using oxen and stoneboats. They were a way to use all of the stone left in the soil after the glaciers retreated. All of Vermont was agricultural in the past so there are thousands of miles of walls across the landscape. If you dig or plow the soil here you can’t help but unearth field stone. The easiest thing for the farmers to do was build walls with all the stone both to delineate property lines and fields and keep in animals.